latest techniques for spinal surgery. 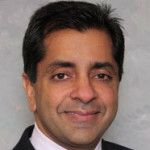 Munish C. Gupta, M.D. is an adult and pediatric spine care specialist. Dr. Munish C. Gupta currently serves as an Pediatric and Adult Spinal surgeon in the Department of Orthopedics at Washington University in St. Louis, Missouri. His practice began there on September 1, 2015. His vast expertise focuses on spinal reconstructive surgery, including the repair of spinal deformities associated with scoliosis, multiple surgeries, and other severe spine problems. Dr. Gupta is conducting ongoing research for spinal fusion techniques. To make an appointment, please call (314) 514-3500. I want to apologize in the delay sending you this email. The care my husband received when he was at Barnes during and after his spinal fusion surgery was absolutely flawless. Your attention to every detail and your warm personality made the visit feel far less traumatic for all of us. Thank you for doing such a great job. The team on that floor were also outstanding and I can’t say enough wonderful things about the BJC patient care system. Thanks for everything you did for us and your follow up. You are a gem and patients and their families will have a more positive and healing outcome thanks to your wonderful care and concern. Have a wonderful holiday season! Warm regards, G.E. and M.E. I received a phone call today from the wife of your male patient. L. H. is back in Wisconsin and recovering well after being in St. Louis for the past 8 weeks. His wife wanted to let me know that during his stay at BJH in October 2015, they received "wonderful, awesome and professional" care. She stated "they even knew when you needed a hug." The staff in the PACU helped calm her nerves before both surgeries. She also stated that Dr. Gupta's bubbly personality when rounding on her husband in the ICU was refreshing. A skillful, compassionate, perfectionist surgeon. A great teacher and role model for deformity surgeons worldwide. I have known Dr.Gupta for a very long time. I have always been impressed by his absolute devotion to the welfare of his patients. 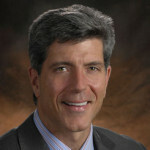 His skill and passion for improving his patients' quality of life are clear. Most impressive is the humility with which he goes about all of this. Munish Gupta is a very accomplished surgeon with an excellent knowledge base and outstanding surgical skills. He is very thoughtful and caring physician. Munish Gupta MD is regarded as THE FINEST spinal deformity surgeon in the world. He has extraordinary talent and his patients all love him. Dr. Gupta is a world-renowned thought leader in spinal deformity care. He is one of my few sources [to whom] I turn to discuss difficult patient problems. One of the best doctors I have ever had. He took great care of me. Dr. Gupta, you are the best doctor in this field! We cannot thank you enough for all your excellent work and assistance you offered us during my son’s surgery. We are grateful and we wish you the best in Wash U. Thanks a bunch — hope you like Washington University! It’s been 2 years and she is doing great. No complaints about her spine. Dr. Gupta and his team did a really amazing job. Thank you so much. The diagnosis and recommendation for surgery were shocking and overwhelming. Our family is so blessed with the care received by Dr. Gupta. My daughter had an amazing outcome and after only a couple of months, is better than ever. Dr. Gupta made the experience so much easier for my family and me. Dr. Gupta is the greatest doctor I have ever known. I wish he was staying at UC Davis. He takes care of me well. And he is a nice guy. Thanks Dr. Gupta for your treatment and advice. Thank you for everything you have done for our two sons. We will be eternally grateful. Our care with Dr. Gupta was life changing for our daughter Auburn. 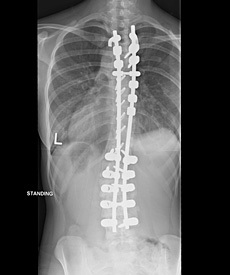 His expertise in scoliosis surgery has given her a new lease on active life. We recommend him to everyone. He is AMAZING!! An absolutely caring and fabulous doctor that saved my daughter’s life. You couldn’t get a better doctor than him!! We should know. We have been with him since 2006! Thank you! Dr. Gupta fused 16 vertebrae and made me a whole new man. He’s a great man, and I’m very grateful for what he did for me. Excellent! And always with a smile . Dr. Gupta and his team did an amazing job correcting with curvature of my son’s spine. The results are better than we expected. Recovery was difficult in the beginning, but we are now 6 weeks post surgery, and he is starting to resume regular household activities. Thank you Dr. Gupta for all of your encouragement and support during this challenge. The degree of pain relief has been so great that I now know I should have had this surgery sooner. Dr. Gupta told me what to expect and he was exactly right. Wash U is getting a wonderful surgeon. I love him! Excellent work. I’m a new person thanks to Dr. Gupta. Dr. Gupta provided amazing care. He performed a very long and complicated surgery, the results of which were better than I could have imagined. I would recommend him for anyone looking for spinal care. He is a life-saver and has kept me walking all these 18 years. I have been blessed. My daughter had a wonderful surgery. Thank you! Dr. Munish C. Gupta specializes in the correction of spinal deformity in pediatric and adult patients, particularly scoliosis, kyphosis, spondylolisthesis, revision surgery, and flatback deformity. Surgical procedures include anterior release and posterior spinal fusion, as well as spinal osteototomies: vertebral column resection and pedicle subtraction osteotomy. Dr. Gupta has extensive expertise using a four-rod Pedicle subtraction osteotomy that has been shown to prevent rod breakages and reduce complications such as pseudarthroses. Lateral curvature of the spine greater than ten degrees, with rotation of the vertebrae within the curve. Rotation of the vertebrae also occurs which produces the rib cage and flank muscle asymmetry. A forward, exaggerated rounding of the back, most common in older women due to osteoporosis, but can also occur in infants and teens. Occurs when one vertebra slips forward onto the vertebra below it, causing numbness or pain in the back or legs. Additional surgery to correct a problem that is worsening or did not heal properly after previous procedures. Forward posture usually due to a flattened lumbar spine from postoperative or degenerative changes. When viewed from the side, the patient’s head may be several centimeters in front of their hips. 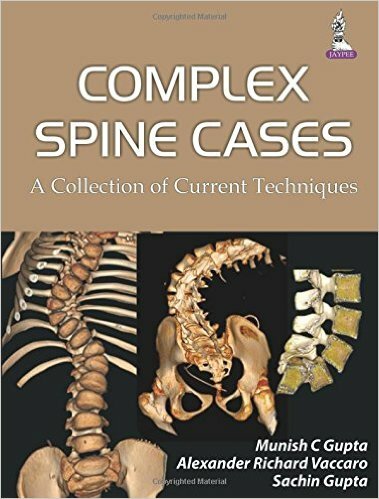 This book is a comprehensive guide to the management of complex spine cases. Presented as a series of case studies, it brings together the experiences and knowledge of expert contributing specialists. Divided into five sections — Early Onset Scoliosis, Pediatric Spinal Deformity, Adult Spinal Deformity, Trauma and Tumors, and Cervical Spine — each part explains numerous cases relevant to that topic, describing the challenges, techniques for management, and pitfalls, for each one.